It is difficult to believe that the Le Motographe Skeleton is road legal. In fact, that was the prime directive for the French bike builder while making the bike. Their customer requested for a dirt bike that could be legally ridden on the road as well. 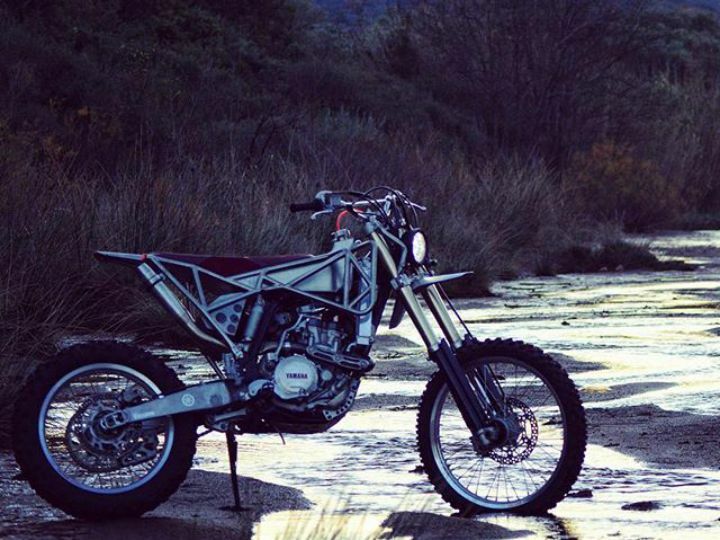 For this, the custom bike team consisting of Jerome and Yvan got a 2004 Yamaha WR450F as a donor bike and set off completely changing the look of the dirt bike. The masterstroke in design comes in the form of a strong external frame that not only holds the bike together but acts as a protective frame around the fuel tank and twin radiators. Even the minimalist round LED headlamp gets protection around the sides. We dig the raw finished aluminium fuel tank that has been left exposed, beautiful welds and all. In case you were wondering where the tails lamps are, they are tiny round LED units each capping the aluminium tube frames at the back. While the entire bike is finished in brushed steel, the triangular seat is wrapped in a nice contrasting maroon velvet and leather. Very 70’s. Le motoGraphe is known not only for their stunning, made-to-order creations but the fact that each one of them can be ridden on a regular basis. In some cases, even better than the donor bike. Like here. The Skeleton here weighs some 10kg less than a stock 2004 Yamaha WR450F and makes 5PS more thanks to a K&N filter inside a custom built airbox and complete free-breathing handmade exhaust system. The long-travel suspension too was tuned according to the customer’s requirements. The end result: A 55PS (at the rear wheel) custom enduro that weighs a scant 108kg (kerb). What next? A custom WR450F Supermoto nicknamed the Skeleton V2. Stay tuned for our series of custom special motorcycles. Share your experiences with MT 03?